Your 5.0 cu. ft. GE Free-Standing Electric Self-Cleaning Range in White features a Digital Temperature display. Two 8 in. 2600-Watt burners (right front and left rear) let you cook large meals. The 4 burner upswept cooktop easily wipes clean. The chrome drip bowls contain spills and remove for easy cleaning. The coil heating elements produce even heat and easy cleanup, also. GE appliances provide up-to-date technology and exceptional quality to simplify the way you live. With a timeless appearance, this family of appliances is ideal for your family. And coming from one of the most trusted names in America, you know that this entire selection of appliances is as advanced as it is practical. Range Size 30 in. 30 in. 30 in. 30 in. Does this stovetop prop up so you can clean under it? Does the cook top lift up for easy cleaning? Hi Mike, This is Lisa from GE Appliances. Thank you for your question. I am happy to help. Press &quot;bake&quot; the +/- arrow to set your temperature, then &quot;start&quot;. I hope this helps. Thank you for checking with GE Appliances. 5.0 cu. 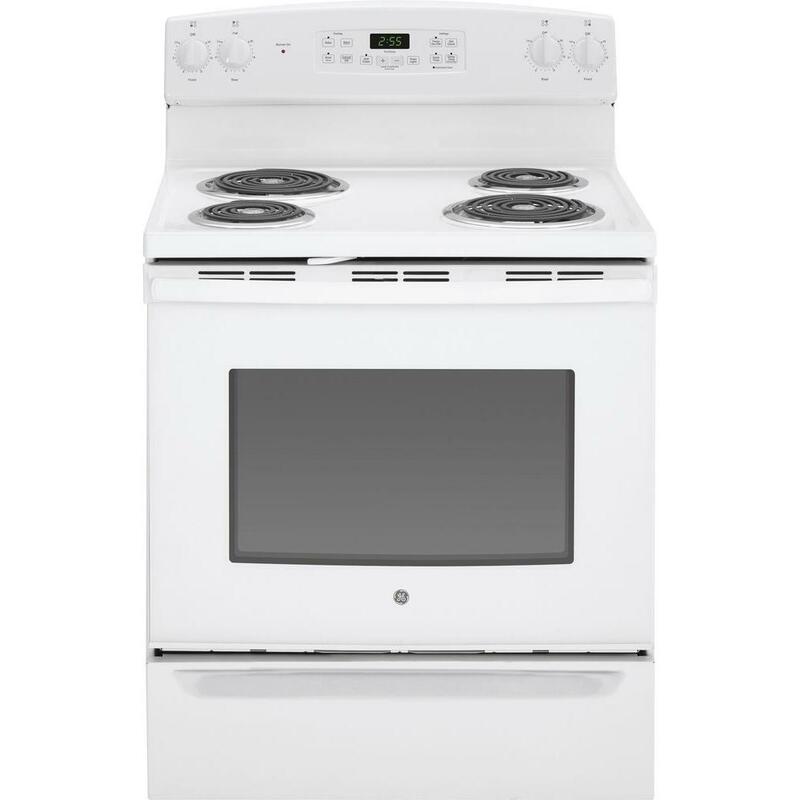 ft. Electric Range with Self-Cleaning Oven in White is rated 4.3 out of 5 by 787. Rated 2 out of 5 by Trina from The sensory device they put in the middle of the burners are horrible. Good luck if you fry chick... The sensory device they put in the middle of the burners are horrible. Good luck if you fry chicken and the burners wont allow you to get hot enough to fry chicken. It's ridiculous. It's a stove design for people who do not have common sense. Yes safety is important, but I have been cooking for 40 years and I do not need this safety feature. I should at least have a choice, but this is the way they are going to make them for now on. I will be going to a used appliance store and purchasing the stoves they made correctly in the past. Btw the large see through glass of the oven part I like. That's it though. Rated 3 out of 5 by Cookie from Bought this range a few months ago. Needed a self-cleaning, larger oven, window in front, in bisq... Bought this range a few months ago. Needed a self-cleaning, larger oven, window in front, in bisque. This ticked those boxes. Looks good, electronics seem fine. The SensiTemp feature is what makes it a product I would NOT recommend. Here's why: The stove decides what is a safe/unsafe temperature--which sounds good if you have people in your house who let a pan boil/burn dry. But if you are stir frying. or boiling water for pasta, or hard cooking an egg: before the food cooks, water even comes to a full boil, or the egg is done, the burner cycles back, cools off, and you lose your "edge" as a cook. I do lots of jam, jellies, and sometimes canning. For jam/jellies you need to hold what's called a "full rolling boil"--a boil that cannot be reduced by stirring. If you reduce heat during that critical time, you will end up with soup, not jam. I fully expect a disaster this summer during that heavy cooking season. Rated 1 out of 5 by PG from Have new stove and the sensi temp coil won’t allow a large pot of water to continually boil water... Have new stove and the sensi temp coil won’t allow a large pot of water to continually boil water. Tough to cook pasta with these burners. Would avoid models with this newly mandated safety feature. DOES NOT ALLOW WATER TO BOIL. Rated 4 out of 5 by Alice from I have been enjoying my new GE electric range for about 2 1/2 weeks now. It looks great and fun... I have been enjoying my new GE electric range for about 2 1/2 weeks now. It looks great and functions perfectly so far. I gave it 4 stars only because I was disappointed that the drawer is not deep enough to hold all of my pots and pans as my old range did. 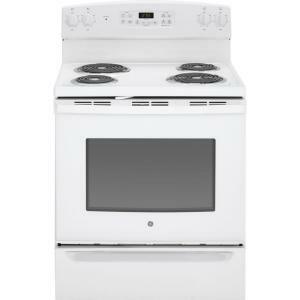 Otherwise I have no complaints and would recommend this GE range for its looks, features, and excellent price. Rated 3 out of 5 by SocialSallyG from OK, BUT..... - The electronic oven controls are NOT intuitive. - Manufacturing standards are suspect: The exterior "shell" has gaps/holes at the outside corners where the control panel connects to the stove. I covered those holes/gaps and the entire seam with black & white checkered Duck Tape, which I like better than the open gaps!! Rated 5 out of 5 by KB from Range is excellent. Easy to use and to keep clean. Excellent temperature accuracy. This is a ste... Range is excellent. Easy to use and to keep clean. Excellent temperature accuracy. This is a step up from previous range. Love to program meal to start later when I am out and have it cooked when I return. Rated 1 out of 5 by Beyondsad from If you are really a cook...do not buy this range with "sensi-temp" technology...the burners dial ... If you are really a cook...do not buy this range with "sensi-temp" technology...the burners dial back their temperature when boiling. I had water boiling for 5 min...dropped in broccoli and the burner went dark...and then a few minutes later started up again. I tested all the burners and they dropped temp at different times (2 at 5 min, 1 at 3 min, and 1 at 12 min. You cannot cook like this. I cook all the time and can veggies in the fall....this is a very bad feature for a true foody. I called GE....no satisfaction...and Home Depot"s current policy denies me any recourse after 48 hrs....I am poor so I am stuck with an inferior stove.